"This is a win for all parties concerned," said Maj. Gen. Glenn K. Rieth, The Adjutant General of New Jersey. Representatives of the New Jersey Air National Guard, New Jersey Conservation Foundation, New Jersey Pinelands Commission and state Green Acres Program met at the 177th's Warren Grove Range on March 24 to sign a Deed of Easement between the New Jersey Conservation Foundation and the 177th Fighter Wing and the New Jersey Department of Military and Veterans Affairs and the State of New Jersey, to use on behalf of the 177th Fighter Wing and the New Jersey Air National Guard. "Through partnering with the Air Force and conservation organizations, we were able to come together to meet common goals of preserving the habitat, preventing encroachment, and creating buffers around military installations." said Bob Moore, Director of the Air Force Real Property Agency. This easement preserves the 107-acre Oswego Gun Club located in Bass River Township and a nearby five-acre property. The Club, which is surrounded by the Range and the Bass River State Forest, is the first in the state to be preserved by a nonprofit group using funding from the Department of Defense Readiness and Environmental Preparedness Initiative (REPI), which provides funds to preserve land surrounding military installations. 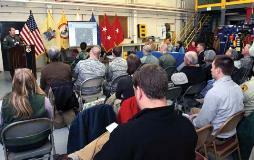 Warren Grove Range Commander Lt. Col. Thor O. Himley, left at podium, addresses a crowd of elected officials, conservationists, members of the New Jersey National Guard and the media during a signing ceremony at the Range on March 24. The Foundation purchased the Oswego Gun Club property for $106,000, using $30,000 from REPI, $35,310 from the Pinelands Conservation Fund and $40,667 from the state Green Acres Program. In turn, a conservation easement will be held by the United States Air Force. An additional property was purchased for $21,000, using $11,000 from REPI and $10,000 from Green Acres. "We're proud to be part of this conservation 'first' in New Jersey, and we're looking forward to partnering again with the military in the near future," said Michele S. Byers, Foundation Executive Director. "The purchase and conservation easement ensures this land is managed in the most cost-effective and environmental friendly way while ensuring the Warren Grove Range is able to continue as a vital East Coast training facility for combat aviation," said Rieth. Sgts. 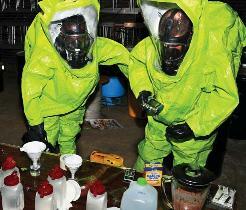 Brandon Botley, left and Michael Issenman, right, of the 21st Civil Support Team (Weapons of Mass Destruction) take samples during a joint exercise with multiple local, state and federal agencies including the United States Coast Guard Atlantic Strike Team, the Environmental Protection Agency from Regions 2 and 3, and the Burlington County Hazardous Materials Response Unit at the Burlington County Fire Academy from Feb. 16 to 19. The exercise enabled all the units to practice their skills and more importantly, to test the coordination of efforts between multiple agencies working within an Incident Command System to protect our state and nation. Photo by Stan Fayer, Senior Investigator, Burlington County Environmental Crimes.